[Updated posts merged from November 20 and 21, 2017] I asked people in and near the Wisconsin Department of Natural Resources in early 2106 to assess the mood after several years of GOP Gov. Scott Walker's "chamber of commerce mentality" management directive. That post, here, is in the top-ten most downloaded items among 16,000 other items on this blog since it began in February, 2007. - - and soon for newly-permissible sulfide metal mines. So I asked a large group of veteran Wisconsin environmental and water experts, conservation advocates, citizen activists, science and environmental writers, and others, to again comment on these important Wisconsin public health, safety, legal and policy issues. Here is Part One, from Nov. 20th. From the inside - - "Desperation at all levels of the DNR." The past year has really shown me how the GOP is afraid of and caters to their wealthy donors - some of whom aren't even that generous. It was obvious before but this year has been brutal. DNR administrators support any development project regardless of environmental impacts. They are not interested in the environment or public health. If they can't maneuver around the law by bending it, the legislature simply changes the law. I have witnessed administrators simply ignoring valid environmental and legal concerns from experienced, competent employees and I have seen administrators ignoring the process for determining environmental hazards when granting permits. It is true that DNR doesn't follow their own processes and skirts the law when possible. The Secretary's office seems to have a lot of power. And when that power is wielded by an incurious, pro-business person, bad things happen. So far, even in his short tenure, Dan Meyer has proven himself to be the same as Cathy Stepp. The only real check on unbridled donor power is the citizen groups and nonprofits who sue. Most of these groups are focused on local problems so it is difficult for the average person to know what damage is being done to other parts of the state. And let's face it, the Supreme Court of Wisconsin is mostly unsympathetic to the average citizen. The DOJ under Brad Schimel is complicit in twisting the law. There is a message I would like to send to Wisconsin: Make no mistake, Wisconsin is being sold off piece by piece to rich individuals who own the party currently in the governors office. And that party is more than willing to promote (for money) the destruction of the environment in order to stay in power. These rich donors (at least the ones I have met) aren't exceptional. They are ridiculously selfish people less worthy and no more intelligent than you. They are stealing your water, polluting your air and compromising your health and wealth. We deserve better. Governor Scott Walker’s administration and the current legislature continue to threaten Wisconsin’s natural resources through bad legislation, an anti-environment state budget, a toothless DNR, and reckless policies designed to dismantle Wisconsin’s renowned reputation for conservation – and let corporate interests run roughshod over the state. Sen. Tom Tiffany’s Industrial Acid Mining Bill, SB 395, which will open Wisconsin to America’s most toxic industry, sulfide mining. The bill is waiting to be signed by Walker, and will repeal the Prove It First mining law, paving the way for foreign mining interests to poison our waters, render local ecosystems lifeless, and damage our wildlife populations. Foxconn, a $3 billion tax giveaway to a Taiwanese corporation that won’t have a positive effect for at least 20 years – if ever. Foxconn poses a direct threat to the Great Lakes, our state’s wetlands and rivers, and the quality and abundance of our drinking water. These and other recent moves by the Walker administration and the legislature have made it abundantly clear we’re living under a pro-polluter regime that is emboldened by its majority rule. However, those anti-conservation efforts are beginning to show cracks, as evidenced in polling. On the outside, "it's painful to watch..."
It’s painful to watch Scott Walker in campaign mode, especially if you are old enough to remember that Wisconsin once led the nation in progressive environmental protection, following the lead of Increase Lapham, John Muir, Aldo Leopold, Gaylord Nelson, Lorrie Otto and dozens of others who loved our diverse, beautifully mysterious gift of nature. In speaking and writing, they proved they were real humans of titanic character, clear of thought, who expressed their passions for this place, wearing their hearts on their sleeves, leaving an imprint of their values permanently in place for their fellow citizens to emulate. 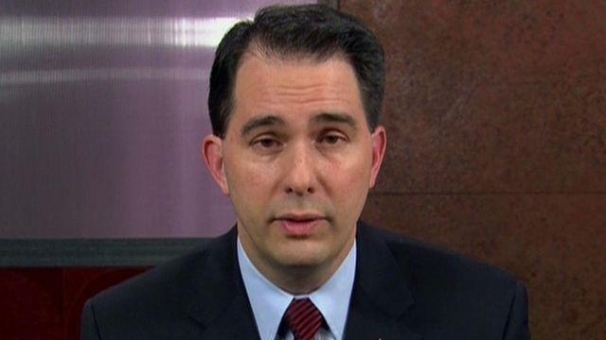 By contrast, the campaigning Walker is his own invention of a person he is not. The rehearsed smile, the little nod, more like a plastic bobble-head doll than a natural orator, the carefully composed empty sentences that ring with phrases like “keeping your hard-earned money” even when he is scheming to pass another tax cut for his billionaire backers. Or to ban any public discussion of global warming. Or to further shrink the scientific staff of the Wisconsin Department of Natural Resources. Or to invite gold and copper sulfide mining, which always renders large tracts of land and waterway unusably toxic. Or to try to undermine the gloriously useful Wisconsin Idea. Or to destroy primitive wetlands, prime habitat for wildlife and rare plants. When the campaigner Walker speaks, your eyes look through the pathetic plastic invention standing before you on the stage to that group of shadowy figures behind him pulling the strings, the few billionaires from Wisconsin and the Koch brothers, the winking oligarchs who back this drama, his true masters for whom he has staged this sad, little one-act Punch and Judy show. - - Paul G. Hayes, former Science Reporter, The Milwaukee Journal. From legislators, citizens get "no indication they were listened to." 1. Legislators keep sticking provisions in legislation for sand fracking which overturn local controls - - stories here and here. 2. The Foxconn law which gives away public resources by exempting wetlands from regulation, circumvents the law and citizens' rights in [judicial] venue, and requires no Environmental Impact Statement. This is connected to the wetlands' deregulation bill, too; remember State Rep. Adam Jarchow said we should deregulate all wetlands to create an equal playing field with Foxconn. After centuries of developing Wisconsin’s public trust doctrine through statutes and the courts, the Wisconsin Legislature has been reversing course. To date, the courts have continued to serve their Constitutional role, in the founder’s scheme of separated powers, to interpret the law’s meaning and check the legislature. [T]he river Mississippi and the navigable waters leading into the Mississippi and St. Lawrence, and the carrying places between the same, shall be common highways and forever free, as well to the inhabitants of the state as to the citizens of the United States, without any tax, impost or duty therefor. Art. IX, § 1 of the Wis. Constitution. When Wisconsin became a state and became a trustee of all of the state’s navigable waters, the public trust doctrine protected public uses for commerce, navigation, and fishing. Starting in the early 1900s, Wisconsin courts developed the common law (that is judge made law) to reflect the importance of water in people’s lives, and recognized the public trust doctrine protected more non-consumptive uses of water, such as many forms of recreation. Today that recreation, of course, is big business in Wisconsin and built on clean and abundant water. The only Great Lakes state supreme court to address the issue, Michigan, recently held the protected public uses include walking on the beaches of the Great Lakes. The Wisconsin Supreme Court’s opinion in Lake Beulah Management District v. Wisconsin Department of Natural Resources, logically expanded the public trust doctrine by applying it to groundwater hydrologically-connected to navigable waters. After this, the court ruled in Rock-Koshkonong Lake District v. Department of Natural Resources, and some commentators have misinterpreted that decision as the state’s highest court reversing their long embrace of the public trust doctrine. In fact, the court ruled on other grounds and their opining on the public trust doctrine was dicta (unnecessary for the decision and carrying no precedential weight). In recent years, however, public uses of the state’s water have been threatened by the Wisconsin legislature. Most recently, with the special legislation for Foxconn, exempting the company and any others that locate in the new tech zone from following a variety of state water laws designed to protect the public’s uses of water. However, if the courts perform the function the founders designed them to serve, they will continue to closely scrutinize the Legislature’s actions to determine whether the statutes they pass are constitutional and do not substantially impair the public interest in the state’s shared water wealth. This was recently on display in Dane County when the Circuit Court in Clean Wisconsin, et al. v. DNR (Oct 11, 2017), when the court vacated the DNR’s approvals of several high capacity well permits for wells that would damage public trust waters. During the course of this litigation, the DNR indicated that the Wisconsin Supreme Court “got [it] wrong,” which the Circuit Court noted disapprovingly, since it is a serious misreading of the power of the agency to think its role is to say what the law is and ignore the Supreme Court’s binding decisions: that power resides in the courts alone. Parroting Great Lakes Legal Foundation arguments the Wisconsin Supreme Court had previously soundly rejected, the DNR claimed the public trust doctrine did not apply to protecting water levels, the DNR could only consider impacts enumerated in the high capacity well statute, and the DNR could not consider cumulative impacts with high capacity wells. The court held the DNR misinterpreted the law on all counts. Because the court is bound to follow the precedent of the Wisconsin Supreme Court, it further held the public trust doctrine places an affirmative duty on the DNR to act to protect the state’s shared waters. The DNR is behaving like a developer's "private contractor." Friends of the Black River Forest, (FBRF), has followed the DNR for four years as it has worked to smooth the regulatory path for the Kohler Company’s proposed golf course on the shore of Lake Michigan adjacent to Kohler Andrae State Park. The DNR has been tasked with justifying the damage to rare wetlands and the giveaway of our state park land to the Kohler Company by former Secretary Cathy Stepp. The DNR continues to use primarily Kohler provided information to write its Environmental Impact Statements. It has resorted to Skype weekly meetings on the Kohler project to avoid records’ requests. It has presented public information forums that mislead the public as to what work is being done for Kohler. The DNR has asked its oversight body - - Wisconsin Natural Resources Board - - to proceed with the process of amending the Kohler Andrae Master Plan so Kohler can use and impact up to 20 acres of our park land with the construction of a main entrance rotary, a road to the golf course and 24,000 sq ft. of maintenance buildings. The DNR presented only Kohler’s preferred option to the Board. The DNR is presenting an application for Kohler to the National Park Service asking for land purchased with federal funds to be converted to private land for Kohler’s use. Again, the DNR presented only Kohler’s preferred plan rather than the option of Kohler using its own land. FBRF continues to challenge the DNR’s inaccurate and incomplete information. We challenge the DNR’s working as Kohler’s private contractor. FBRF has records showing Scott Walker’s office working with the Kohler Company to influence the annexation of State Park, Town of Wilson and Kohler lands to the City of Sheboygan so Kohler would not have to follow Wilson’s requirement of environmental impact evaluation. The Legislature is attacking environmental protections in Wisconsin "at a stunning rate." The majority in the Legislature is attacking environmental protections at a stunning rate. Just last year, not content to pass sweeping legislation to try and limit the DNR's regulatory authority, the Legislature requested an attorney general's opinion to reinforce their edict that DNR could not impose conditions when permitting high capacity wells. Clean Wisconsin challenged nine well permits that were issued after the AG's opinion, for proposed wells that DNR's own scientists found would have significant impacts on nearby water bodies. The DNR's attorney argued at the hearing that Wisconsin Supreme Court justices who unanimously held (in the Lake Beulah case) that the Public Trust Doctrine requires DNR to consider environmental impacts of high capacity wells "got it wrong." Owing to reduced DNR oversight and regulation of bear hunting--particularly bear hound training--the state’s northern landscape of national and state forests and public lands is overrun from July through October with untold numbers of hound hunters, many of whom are out-of-staters who migrate here for the summer from the South to train large packs of GPS-collared free roaming hounds to pursue bears and their cubs (for hours on end in the heat of summer). Worse, with the elimination of the Class B training license requirement in 2015, the DNR has no way to know how many such hound-hunters or bear hounds are present on Wisconsin’s public lands or how they are conducting themselves. Similarly, the DNR concedes that it has no idea how many millions of gallons of bear bait—comprised of any number of foods, including fryer fat, marshmallows, donuts, even chocolate—are placed on public lands and near trails and campsites by bear hunters in advance of the hunting season. What people do know, when they attempt to access trail heads on public lands and parks, is that baiting stations, like mini-garbage piles, pose obvious safety concerns given their attraction to predators. Notwithstanding Wisconsin DNR’s promotion of state lands as “family & pet friendly,” the reality couldn’t be farther from the truth. There’s no denying that over the past several years, there has been a dramatic shift to expanding hunting on state lands. Currently 97-98% of DNR properties are open to hunting and trapping, added to the 5 million acres of huntable federal and county property. The controversial state law enacted in 2012, known as the Hunting Heritage Bill (Act 168), which opened State Parks to hunting and trapping, together with DNR’s authorization of year-round 24/7 (day and night) coyote hunting have created a state landscape in which very few places remain where Wisconsin families can enjoy nature on public lands without risk that they or their pets will be shot or injured in a trap. Case in point, Wisconsin DNR’s ongoing failure to prohibit nighttime coyote hunting consistent with public safety considerations and the agency’s bar on nighttime deer and bear hunting led to last year’s tragic events involving Madison area veterinarian, Deanna Clark, DVM, whose two dogs were shot and killed by a coyote hunter on a public multi-use nature reserve in Dane County. Dr. Clark had taken every possible safety precaution, outfitting her dogs with orange reflective vests and wearing a headlamp of her own. Yet her precautions were to no avail given the utter absence of restrictions for coyote hunting in Wisconsin, placing Wisconsin families and their pets in peril and unfairly limiting public access to state lands. After the GOP takeover of Wisconsin nearly seven years ago, our once-proudly progressive state has sacrificed its public trust obligations to ensure environmental protection, public education, transparent government, corruption-free elections and resource management for the common good. The takeover included the governor’s chair and both houses of the state legislature; they used that majority to gerrymander state electoral districts and ensure a Republican majority for a long time. And the State Supreme Court turned overwhelmingly conservative - - the new justices owing their elections to heavy spending by both in-and out-of-state business. Citizen comments reduced from five minutes to three, decisions made before public input was considered, rules changed at the last minute, legislation drafted by lobbyists and special interests that would directly benefit from it, controversial legislation passed in the middle of the night, cameras and recording devices disallowed in legislative chambers (even as legislators were permitted to bring guns into the Capitol), rumors were passed about projects being “a done deal” or “this is going to happen” to discourage opposition, hearings where citizens were mocked or discredited by the legislators holding the hearing, protesters arrested. It became a government run amok, listening to and representing only itself, lobbyists and Big Dark Money to whom it is beholden. Here is Part Two, from November 21st. 2018, an election year in Wisconsin, can be The Year of Winning Clean Water if people vote out the polluters. Which is why as 2017 is ending, I'm posting the second and final part of a series which began on this blog Monday organized around commentary and observation from advocates, experts and insiders exposing the sustained attacks by Republican politicians and state officials who choose to serve special interests and donors. One activist noted in yesterday's installment that Wisconsin had become "a government run amok," and asked "what happened to Wisconsin's Public Trust Doctrine and the ideal of the commons?" "Make no mistake, Wisconsin is being sold off piece by piece to rich individuals who... are stealing your water, polluting your air and compromising your health and wealth." * The scheduling by the DNR of multiple permitting hearings on behalf of five big dairy cattle feeding/manure-producing operations in Kewaunee County - - the very county where so many wells are contaminated with agricultural runoff that the DNR has offered to give away bottled water. * Hearings on November 30th in Sheboygan where a Walker donor is close to being allowed by the DNR to fill wetlands, bulldoze exceptional dunes and cut many acres of woodland in a nature preserve to construct a Lake Michigan shoreline golf course - - and be given exclusive use of state park land for road, building, parking, equipment storage and other private, non-park purposes. The heart of today's installment is a detailed assessment and look forward by Todd Ambs, the former top administrator at the DMR's Water Division when the DNR had a stand-alone Water Division. And which helped drive an authentic science, health and safety mission by a nationally recognized public trust agency that was far different from the 'chamber of commerce mentality' department that Walker has remade and wrecked. Finally, the last word in this two-part series goes to the long-time prolific outdoors water and wordsmith Bill Stokes. "People want our natural treasures to be available for all." From the Foxconn giveaway, to eliminating protections from mining pollution, to granting industry unlimited access to groundwater in the central sands, the story is the same. The Walker administration and allies in the legislature are working diligently to privatize natural resources: water, public lands, wetlands, all of it. They are chipping away at bedrock principles like the Public Trust Doctrine for the sole benefit of corporate special interests. It mirrors efforts taking place on a national and global scale and there is only one way out: people need to find the energy and courage to take on special interests. Attend hearings, contact legislators, enlist local business that rely on clean water and a healthy environment to advocate for common sense protections. As the former Water Division Administrator for the Wisconsin DNR, I have watched with sorrow and dismay as the Wisconsin Legislature and the Walker Administration have dramatically reduced protections for the waters of our state – waters that are held in trust for all of us. From passing a bill that actually prohibits the department from taking actions to protect public drinking water supplies to administrative actions in the department that have decimated the commitment to integrated water resource management, each action has been taken with a disregard for protecting the resource and a laser focus on making it easier for the regulated permit holders to conduct business without regard to the environment. The latest legislative proposal to remove state protections for one million acres of wetlands in the state, ignores a basic fact. The economy is a wholly owned subsidiary of the environment. The third largest industry in Wisconsin is tourism. It sustains much of the state but in particular, the northern third of Wisconsin. We have world class resources in this state. On the water ledger alone, we find 15,000 lakes, 84,000 miles of rivers and streams, 5.3 million acres of wetlands and 1100 miles of Great Lakes shoreline. We have groundwater resources that are the envy of much of the world, let alone the nation, although they are not evenly distributed and in short supply in some areas. We have water resources that have historically provided the foundation for the tourism industry and a strong quality of life for the rest of the workforce in the state, because we had world class protections for these world class resources. All of those protections and in turn, this economic driver for the state, are under continuing assault. Objectives and strategies were developed around those goals. Progress was measured against those priorities. We weren’t always successful and it wasn’t always as integrated and efficient as we aspired to be, but we knew what we were trying to achieve. So what is this DNR trying to achieve for the water resources of our state? I have seen no evidence of a natural resource based mission anymore. Yes, the DNR should always be working to issue permits in an efficient and timely manner. But if the driving force behind those permits is simply to issue them as fast as possible, then just move the whole operation to the Department of Regulations and Licensing and skip the pretense of natural resource protection. Finally, as many people have already pointed out, the real issue here may well be the sheer lack of resources to do the job. Perhaps we should start with funding. Our neighbors in Minnesota raised their sales tax through a state referendum. Voters overwhelmingly approved a tax that generates nearly $200 million a year for clean water, parks, and wildlife. Why not something similar here? If users are supposed to fully fund activities they desire, such as the recent decision to fund state parks only through fees, then we should look to raise other fees as well. * Waste water permits – these fees have not been raised since the 1990’s. * High capacity well permits – last raised in 2004. * Permits for Concentrated Animal Feeding Operations – fees for CAFO’s were last adjusted when we had a total of 40 of these large animal raising operations. We now have nearly 300 and have roughly the same number of staff to review and approve permits and make sure that these farms are operating in accordance with those permits. The stakes here are high, not just for our natural resources but for our economy as well. Make no mistake. Each time we eliminate a protection for our natural capital, our resources, we reduce the ability to sustain our economic well-being as well. - - Todd L. Ambs was the Water Division Administrator in the Wisconsin Department of Natural Resources from 2003-2010. "I and my fellow Wisconsinites try to do our best." If you are fortunate enough to live a long life in Wisconsin, you recognize a sense of pride that is as much a part of your make up as your old bones and joints. And like those aging physical parts that continue to serve, the Wisconsin sense of pride also continues to do its job. It doesn’t make a lot of noise: it doesn’t have to. It is just there as something to feel good about. Its message, more or less, is: I am part of something that in the chaotic scheme of things, where it is incumbent on homo sapiens to live as harmoniously and respectfully as possible with the other life forms and to avoid fouling the collective nest, I and my fellow Wisconsinites try to do our best. Then comes an assault on that sacred Wisconsin pride. Who could ever imagine a state leadership focused on money as opposed to morals and one that is seemingly ignorant of what it really means to be a Badger in a place that truly defines natural beauty? It is like a Pearl Harbor sneak attack with the bombers fueled by outside money and flown by pilots-for-hire under the leadership of a professional con man. Anger consumes energy, and when you are old you need to be careful about such things. So you try to get past it as you watch the unimaginable chipping away at the things that go to make up the Wisconsin pride, dumb, inconsiderate things that were once only the grumbling of bar-room loud mouths as the strength of the Wisconsin pride allowed the populace to ignore such drivel. And then it comes to you: the eternal comforting phrase of the optimist: this too shall pass!.